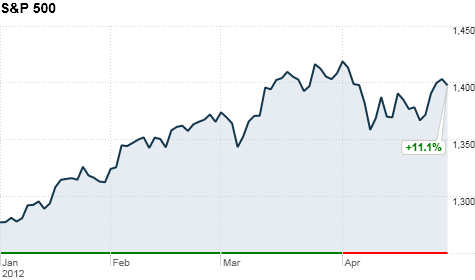 NEW YORK (CNNMoney) -- U.S. stocks finished in the red Monday, ending a mostly sour month on a weak note. The Wall Street adage of "sell in May and go away" got an early start in 2012. Following three months of solid gains, all three major indexes posted their worst monthly returns of the year. The Dow finished flat in April, while the S&P 500 posted a 0.8% loss and the Nasdaq dropped 1.5%. For the first three months of the year, the major indexes had posted an increase of at least 2% each month. Stocks hit a rough patch in April as investors faced a series of U.S. economic reports suggesting a stalled recovery, including a lousy March jobs report at the start of the month and more worrying signs out of Europe. "We're seeing a replay of the movie that was showing in 2010 and 2011," said Mark Luschini, chief investment strategist at Janney Montgomery Scott. "The recent economic data has clearly softened, and concerns over what's going on in Europe are rising again." In that vein, Monday's modest losses were driven by a duo of weak U.S. economic reports and news that Spain's economy has fallen into recession. The Dow Jones industrial average (INDU) dropped 15 points, or 0.1%, the S&P 500 (SPX) slipped 5 points, or 0.4%, and the Nasdaq (COMP) lost 23 points, or 0.7%. Whether or not investors will continue to "sell in May" depends on the upcoming economic news, Luschini said. "Any strength we've seen this month has been on the back of better-than-expected earnings results, but the sustainability of the market at this point is predicated on an accelerated pace of economic growth," he added. Investors will likely be cautious this week amid of slew of economic data that's leading up to the all-important jobs report for April, due on Friday. Economists are expecting that 162,000 jobs were added in April, which is an improvement from March. But that pace is still slow compared to job gains in December, January and February -- which exceeded 200,000. U.S. stocks finished higher Friday, as positive corporate results held more sway than a report showing disappointing first-quarter economic growth. World markets: On Monday, Spain's government said its economy declined for the second straight quarter, revealing the nation is in recession. The report came just days after Standard and Poor's downgraded Spain's credit rating to BBB+ and its unemployment rate hit a record high. S&P downgraded 16 Spanish banks, but the move wasn't a surprise, considering the rating agency's downgrade of the nation last week. European stocks finished mixed. Britain's FTSE 100 (UKX) rose slightly, while the DAX (DAX) in Germany shed 0.5% and France's CAC 40 (CAC40) dropped 1.5%. The Hang Seng (HSI) in Hong Kong ended 1.7% higher. Markets in Tokyo and Shanghai were closed for holidays. Companies: Barnes & Noble (BKS, Fortune 500) shares surged more than 50% after the book merchant sold a 17.6% stake in its Nook e-reader to Microsoft (MSFT, Fortune 500) for $300 million. Shares of Sunoco (SUN, Fortune 500) spiked 20% after Energy Transfer Partners (ETP) said it is buying the refiner in a $5.3 billion deal. Shares of Humana (HUM, Fortune 500) tumbled after the health insurer posted a lower-than-expected first-quarter profit. While the company boosted its full-year outlook, the forecast fell short of analysts' expectations. NYSE's Euronext's (NYX, Fortune 500) stock fell after the stock exchange operator reported a 44% drop in its quarterly profit, in part due to costs resulting from the failed merger with Germany's Deutsche Boerse. Economy: A government report showed that spending by U.S. consumers slowed more than expected in March, even while income rose at a faster-than-expected pace. The Chicago Purchasing Managers' Index for April fell sharply to 56.2, down from 62.2 in March and below expectations for 60. While any figure above 50 indicates expansion, April's reading suggests a significant slowdown in business activity for the Midwest region. 0:00 /4:17Is the Fed blowing up a bond bubble? Currencies and commodities: The dollar rose against the euro and the British pound, but was lower against the Japanese yen. Oil for June delivery fell 6 cents to settle at $104.87 a barrel. Gold futures for June delivery fell 60 cents to settle at $1,664.20 an ounce. Bonds: The price on the benchmark 10-year U.S. Treasury rose Monday, pushing the yield down to 1.91% from 1.93% late Friday.